Ayers Basement Systems specializes in repairing floors that are sinking or unlevel due to foundation problems. Our foundation repair experts will identify the cause of your floor damage and provide you with a quality solution. If you have cracked or uneven floors in your home, give us a call at 1-844-262-2971 or click below to learn more about how we can help you. We offer free estimates in Grand Rapids, Lansing, Kalamazoo and throughout the surrounding areas. You don't have to deal with cracked, unlevel, or sagging floors in your home any longer. Ayers Basement Systems provides complete floor repair services to ensure that you have safe, stable, and level floors throughout your home. 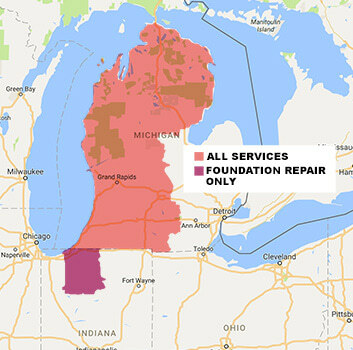 Call us today at 1-844-262-2971 or contact us online to learn more about how we can fix all your foundation problems. We offer free estimates in Grand Rapids, Lansing, Kalamazoo, Jackson, Muskegon, Battle Creek, Traverse City, Niles, Alpena, Mount Pleasant and throughout the surrounding areas.